How to ban someone on your Facebook page: Banning someone is just as easy as removing someone who likes your Facebook page. But the advantage in Banning them is that they won't be able to like it again. Which is a more preferred option for preventing people who only come to spam your Facebook page. Facebook recommend that you should ban people who continually publish spam on your FB Page. You can choose to unban them at any time. Although, when you ban people from your Page, they'll still be able to share content from your Page to other places on Facebook, but they'll no longer be able to publish to your Page, like or comment on your Page's posts, message your Page or like your Page. This is a good option for people you don't want following your Page's posts in their Facebook News Feeds or News Feeds of their friends. 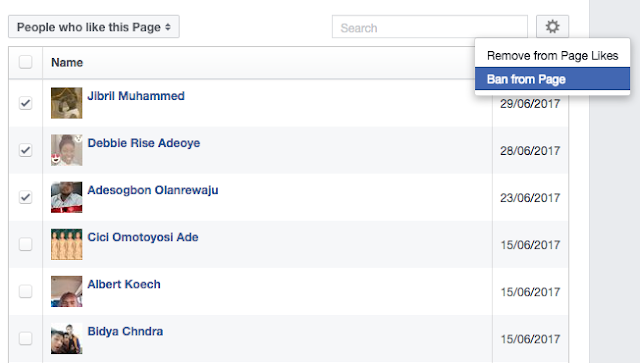 There are several ways to ban a person or another Page from your Facebook Page. Please share this useful Facebook page tips.